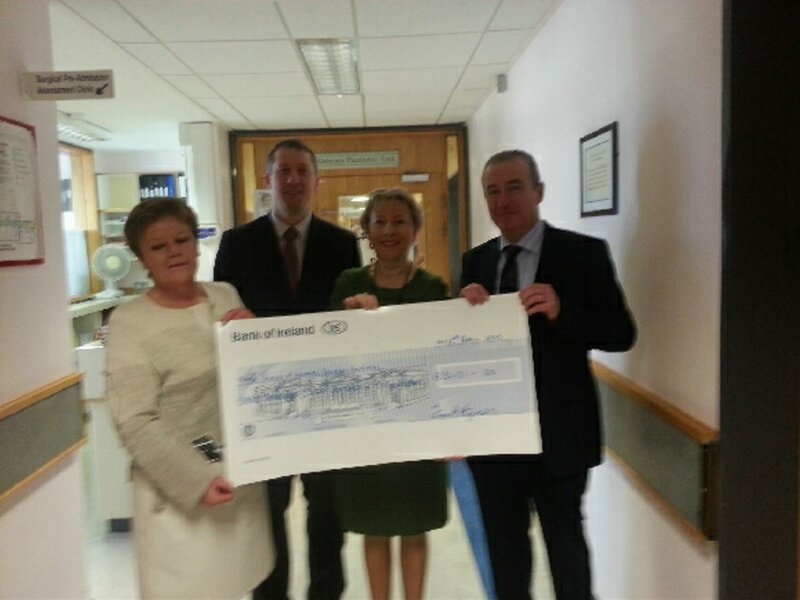 Our thanks to Chris Hannon who presented Friends of Wexford General Hospital with a massive cheque for €2,040 !! Chris organised a table quiz at Tir na Nog pub, Wellington Bridge on March 8th to raise funds for the Coronary Care unit at WGH. Pictured: Lily Byrnes (WGH), Ciaran Sheridan ( Friends), nursing staff, parents and children, St Gabriel’s ward, Wexford General Hospital. 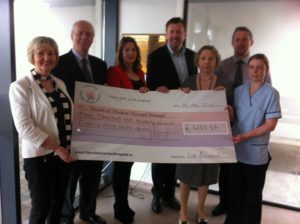 Pictured L-R Margaret Curran (WGH), Ciaran Sheridan (Friends),Fiona Galvin, Dr Con Murphy, Deirdre Keogh (Friends) Mr Ken Mealy. Friends of Wexford General Hospital, on your behalf, purchased much needed equipment for use in Theatre and ICU at Wexford General Hospital.The purchase of the Olympus Endoscopy Stacking System replaces an obsolete unit that could no longer be serviced or repaired. 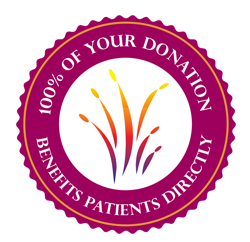 The new system enables physicians at the hospital to have mobile Endoscopy imaging both in theatre and I.C.U. This is particularly helpful in situations where a patient may be bleeding and requires medical intervention under general anaesthesia. 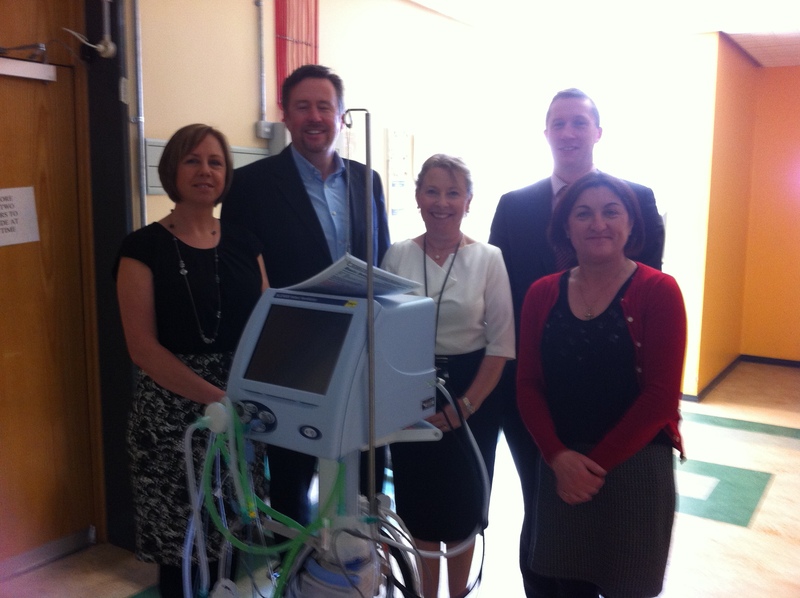 It also enables the anaesthetic team to provide emergency endoscopic interventions in Theatre and I.C.U. 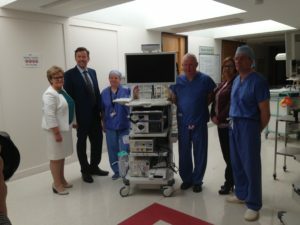 The unit cost almost €77,000 was gratefully received by Theatre staff at the hospital. Well done to the 6 Kiltealy ladies; Marie and Michelle Farrell, Liz Murphy, Caroline Kearns, Majella McGrath and Nicola Flynn Murphy who did the Flora Ladies Mini Marathon last year. 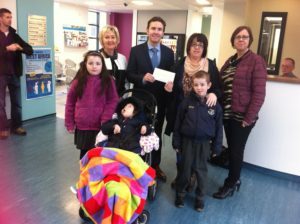 They raised a very appreciated €400! for Wexford General Hospital. 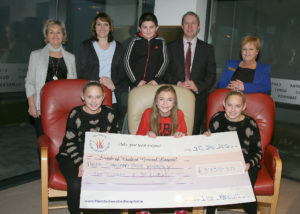 Pictured above is Patricia Hackett (WGH), Siobhan O’ Dowd (WGH), Niall Reck (Friends), Margaret Curran (WGH) and Lisa’s nieces and nephews handing over the cheque. A huge well done to Lisa Anglim,and to her family and friends, who over a number of events raised an amazing €3,330 for Friends of Wexford General Hospital. Sadly Lisa’s uncle died early in 2014. 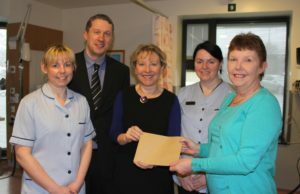 During his illness, he received fantastic care in the Oncology day Care Unit at Wexford General Hospital. 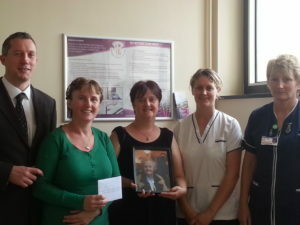 Lisa’s mum decided she wanted to give something back to the hospital and started a fundraising drive. Her first event involved knocking on doors in her area for donations. 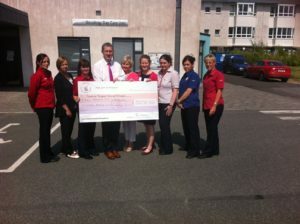 Lisa and her friends ran the Flora Ladies Mini Marathon, another fundraising event. Thanks to everyone who gave to Lisa and her family so generously throughout all of the events. 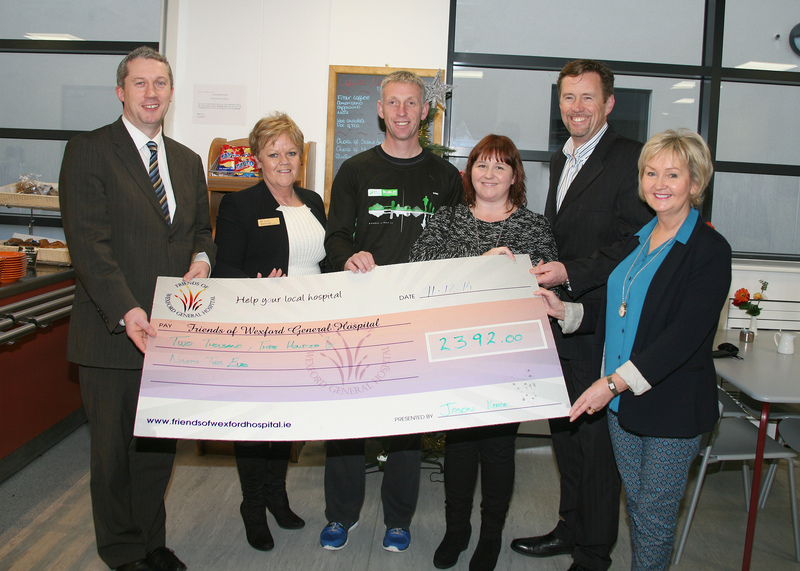 Big CONGRATS and thanks to Jason Keogh and all the fundraisers at Marathon Fitness, Redmond Road, Wexford who raised a fantastic €2,392 for Friends of Wexford General Hospital. Jason ran the Long Island Marathon in New York in May 2014 to raise much needed funds for Wexford General Hospital. 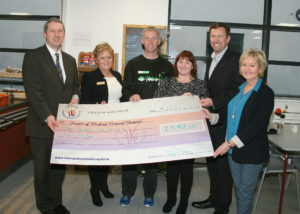 It was important for Jason and his team to raise funds for a local charity. We are delighted with their choice! 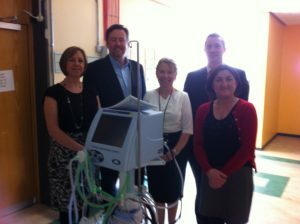 Pictured (L-R) Deirdre Keogh, PRO Friends; Ciaran Sheridan,Chairman, Friends; Lily Byrnes, General Manager, Wexford General Hospital; Niall Reck, Friends and Maria Moore, Wexford General Hospital. Congratulations and thanks goes to Amy Roche for her super and novel fundraiser For Wexford General Hospital. Amy organised a comedy night at the Macamore Inn on January 25th followed by a band and DJ. 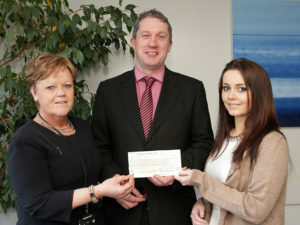 In the process she raised just over €500. Well done Amy. 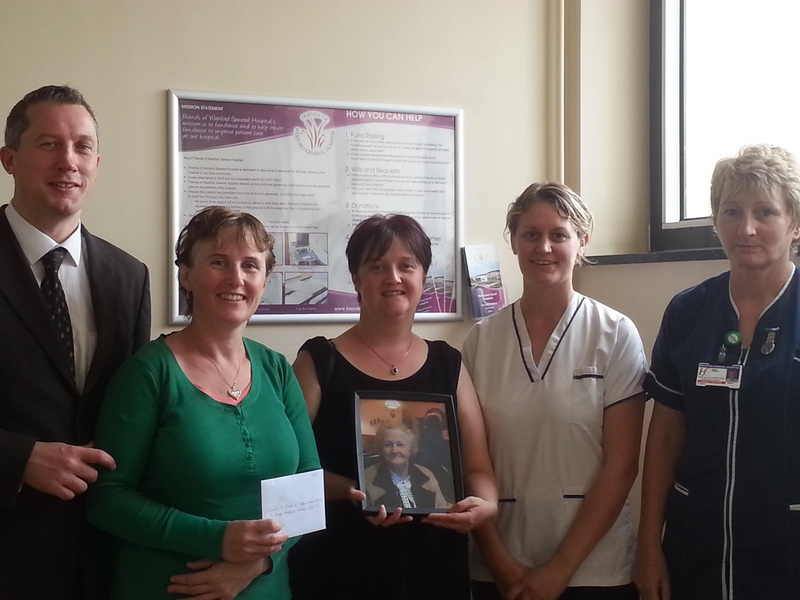 A donation of €70 was kindly made by the Waters family to Friends of Wexford General Hospital in loving memory of their mother Kathleen Waters. Thank you, this is very much appreciated. 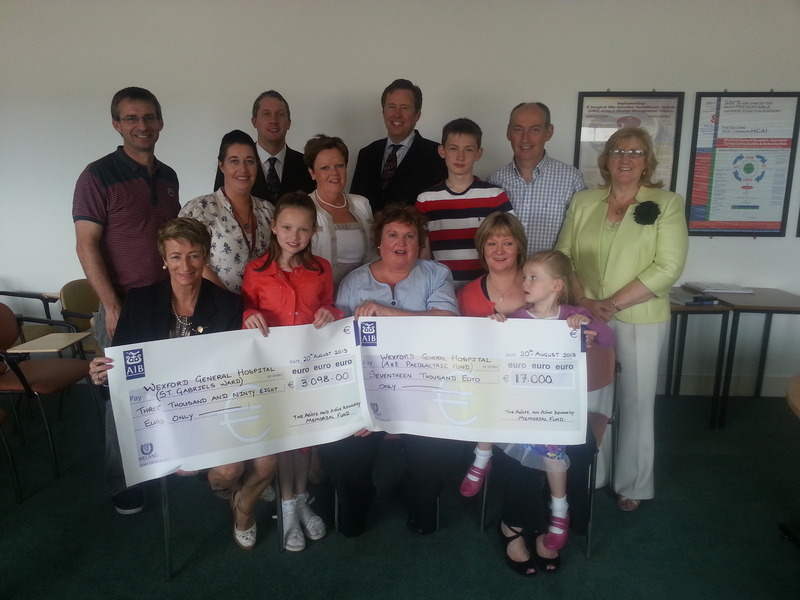 Many thanks to the Aoife and Aine Memorial Fund for 2 fantastic cheques for Wexford General Hospital. 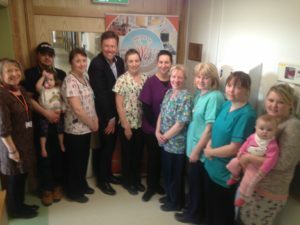 The cheque for €17,000, including a substantial €10,200 donation from DoneDeal, was presented to help with the new paediatric room at the new A&E in memory of sisters Aoife and Aine. 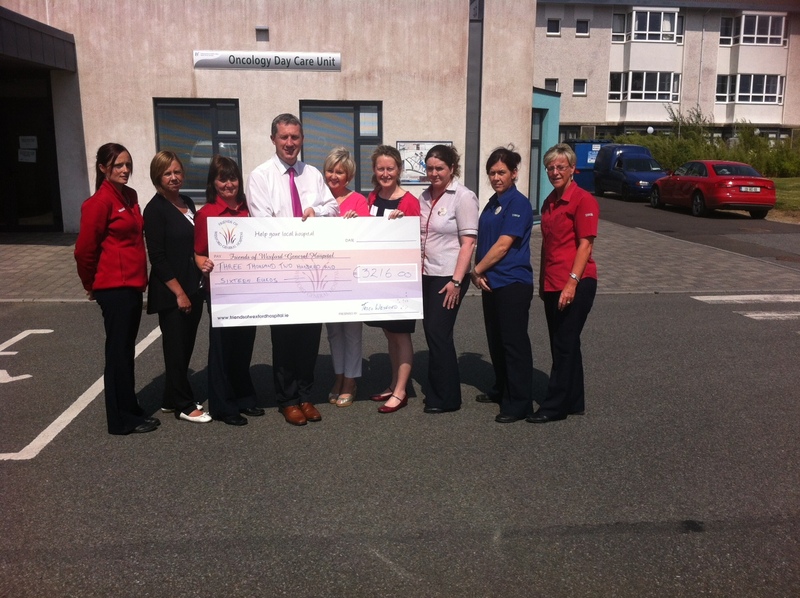 The second cheque for €3,098 was presented to St Gabriel’s ward and was raised through Rosslare Ladies Golf Day. 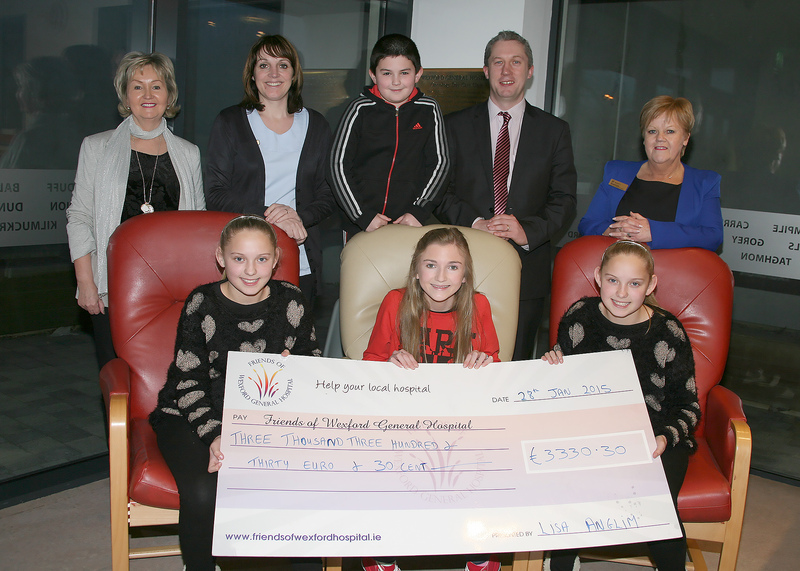 A BIG thank you to everyone who contributed to the Memorial Fund over the past year. 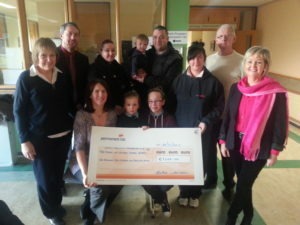 Wax, Shave or Dye fundraiser held at Jack Bailey Pub St Aidans SC 15th Dec 2012. Thanks to everyone involved who helped raise a massive €1,465 for the Friends of Wexford General Hospital. 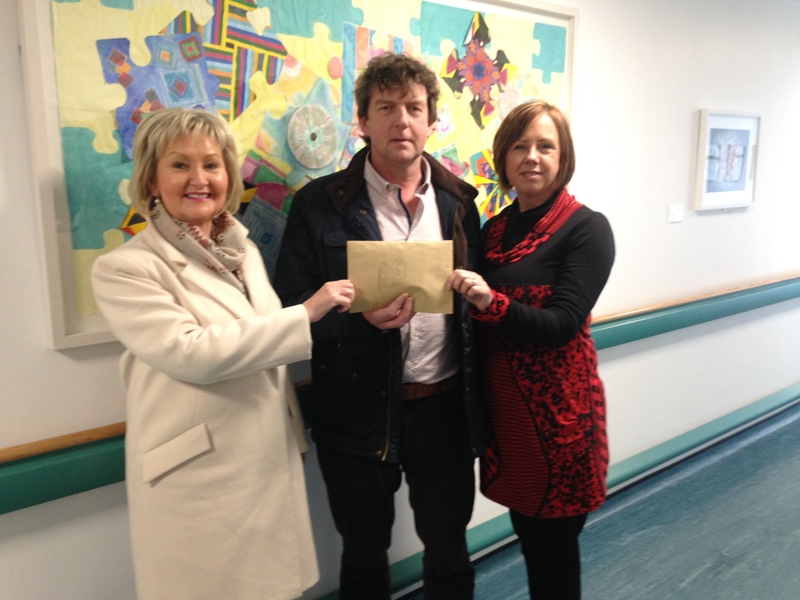 A big thank you to Frank Hynes who handed over a huge cheque for €3,431 to Friends of Wexford General Hospital for St Gabriels Ward. Frank raised the money climbing Africa’s highest peak, Kilmanjaro late last year. Following a fund raising concert at the Riverbank Hotel late last year Dymphna Doyle raised a fantastic €435. Dymphna presented her cheque to Friends of Wexford General Hospital for the Oncology Day Care Centre.